Colts trade Kaura and picks to Spirit for Sadowy and DiTomaso. #OHLTradeDeadline - Very Barrie Colts | A website covering the Barrie Colts of the OHL. 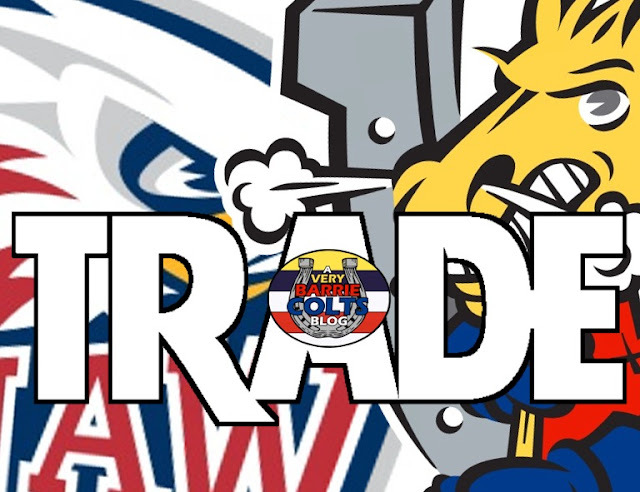 The Barrie Colts announce that they have dealt blue liner Rocky Kaura to the Saginaw Spirit in exchange for Dylan Sadowy and defenceman Greg DiTomaso. The Colts have also sent picks to Saginaw in this deal. Here is the complete deal. Sadowy who was selected by the San Jose Sharks at the 2014 NHL Draft in the 3rd round currently is second on the Spirits for points with 20 goals and 14 assists over 36 games. In his 4th season with Saginaw he has totalled 91 goals for a total of 152 points over 230 regular season games played. DiTomaso has appeared in 159 OHL games where he has totalled 44 points. Kaura leaves the Colts in his second season with the team. He has totalled 3 points in that time. We would like to wish Rocky the best of luck in Saginaw! What are your thoughts on the deal? Some good players coming our way but do you feel that is a lot of picks to let go of? A plus is there is time to try and get some of them back over time. Let us know what you think in the comments!